Our classical router bits make do-it-yourself projects look professional. These bits offer another type of edge detail, the classical pattern, giving you a combination of quarter round and cove profiles with a fillet. These carbide tip router bits are ideal for woodworking projects of all kinds. 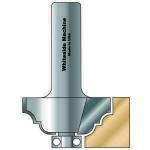 All of our router bits are made by the award winning Whiteside Machine Company. Order your classical router bits below today and save! 5/32" 1/2" 1-1/4" 2-1/8" 1/4"
3/16" 5/8" 1-1/2" 2-1/4" 1/4"
5/32" 1/2" 1-1/4" 2-3/8" 1/2"
3/16" 5/8" 1-1/2" 2-1/2" 1/2"